Sign up not allowed by admin.Please contact admin for the registration. What should you do when someone proposes you? If the person who proposes you can stand next to you in case of anything like if something goes wrong in between both families making your wedding possible? and in this case If he/she says yes they stick with you You then you should go/stick with this person. Dont waste time. At any stage the person who proposed you says like he/she cannot go against his/her parent with any XYZ reasons then you need to understand here that you should not go further because proposal should have come after knowing all these things. The person who is proposing should be clear about his/her decision in proposing someone. 1. Only one person from a family is eligible to apply or register (husband, wife, and children). 2. Naya Pakistan housing scheme is for every common man, thus people who does not own any property such as house are eligible to apply. 3. In the first session the process of registration is taking place in 7 districts only. People ambit in owning a house in any other district would have to wait for the Next step of registration in their required Districts. 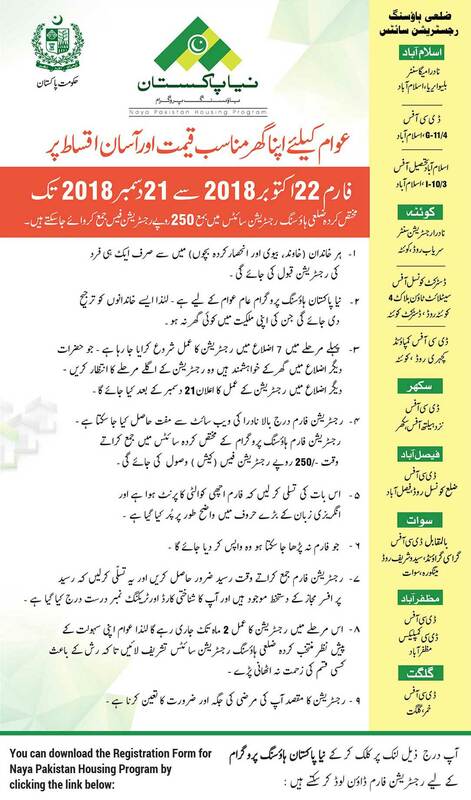 Registration date for other districts shall be announced after 21 December. 4. Registration forms are available (free of cost) on the Registered website of NADRA. The form shall be submitted to the Website of Housing Program, a fee of 250 PKR will be charged and received. 7. Please make sure you receive the receipt, the receipt is signed by the officer (On Duty), and your identity card number and tracking number are mentioned clearly. 8. The registration process will remain open for 2 months and people are encouraged to visit their nearest Provisional Housing Registration sites in order to avoid any kind of issue. 9. The reason of registration is to know your desired location and requirement. Long distance relationships are hard and not everybody understands that. There are more reasons to fight, more reasons to argue, and more reasons to be stressed. You have to put in twice as much effort, twice as much patience, and twice as much trust in order to make it work. The distance, however, gives those couples a reason to love harder than regular couples do. Regular couples get to see each other whenever they want, while long distance couples have to wait long periods of time to see each other and when they do, it’s only for a short period of time. When it’s time to leave, that’s the worst part about it because you don’t want to leave knowing it’ll be for a while until you see that person again. So every moment those couples spend together really matters. They don’t take holding hands, long hugs and kisses for granted. What’s amazing is that although these couples are far from each other most of the time, there’s no one they feel closer to than that person and that’s how you know it’s real and pure love.